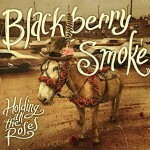 Share the post "Album review: BLACKBERRY SMOKE – Holding All The Roses"
This is amazingly Blackberry Smoke’s fourth studio album, as their last album ‘The Whippoorwill’ was released in the UK last year (although it dated from 2012 when it was released in their native US) and made the top 30 UK album charts. A follow-up live album also made the UK album charts and they have toured the UK frequently these past twelve months or so. Their star is definitely on the rise and they needed this to be a good album; it is and then some! First off they have enlisted Brendan O’Brien (AC/DC & Bruce Springsteen) to handle production and what I like about his production on albums is you can hear the instruments so clearly, a lovely acoustic sound on the quieter numbers. The title track comes from an American phrase holding all the winners and is a mix of country rock and southern rock the band do so well. They even throw in some fast and furious fiddle courtesy of Ann Marie Simpson. ‘Let Me Help You (Find The Door)’ has been released as the lead off song on the album and is one of those anthems that are made for radio airplay and live shows. ‘Living In The Song’ takes aim at the music industry and features a tasty guitar solo. Bob Seger came to mind on ‘Rock And Roll Again’, a good little boogie number, whilst ‘Woman In The Moon’ is the album’s big production number. Vocalist Charlie Starr sounds on fine form, pouring his heart and soul into the song’s lyrics. They have a bit of fun on ‘Lay It All On Me’, a country song with a varied family back story! ‘No Way Back To Eden’ is a aural treat, from the harmony vocals through to the crystal clear percussion in the backing, great stuff. ‘Fire In The Hole’ is another song worth a mention (to be fair the whole album is! ), a classy southern rocker with the guitars mixing well with the Hammond organ playing of Brandon Still. This entry was posted in ALBUM REVIEWS, ALBUM REVIEWS (Mobile), All Posts, The Best of 2015 and tagged album, Blackberry Smoke, country, Holding All The Roses, review, rock, southern. Bookmark the permalink.